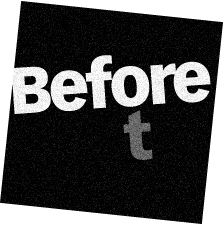 For those of you who have a color logo, have you ever checked it on the receiving end of a black & white fax? You should. Because scanners see colors unevenly (and some colors barely at all), and printers print unpredictably, logo colors are basically uncontrollable. The solution is to create a black & white original, which allows you to adjust the gray values yourself. We replaced our colors with these shades of gray . . .
Much better! The results are a convincing black & white rendition of our color logo. In our case, every gray printed twice as dark our original, for which we adjusted by trial and error. So getting your grays just right will require some fiddling, and the results will not be uniform on every fax machine. But the results are WAY better than the unreadable color version. Try it! This entry was posted in Before and after, Color, Design, Logo design. Bookmark the permalink. 2 Responses to Color logo, black & white fax . 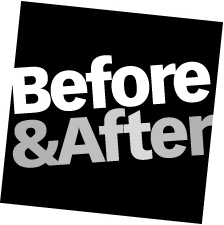 . .
Oftentimes I’ll create a version of a logo that will work properly on a dark background. Take for example the FedEx logo above. On a dark background or photo, the “Fed” would disappear, so I convert that to white. The “Ex” colors are relatively light and bright and will usually stand out on dark backgrounds. I’ve found that having an alternate “white” version of a logo is frequently useful in all kinds of situations, from packaging to brochures, ads, and even the company’s web site. I was taught from my very first design class in college to always present a logo with a black & white version, and I’ve been following the practice ever since. Most people don’t think they’ll ever need a black & white logo, but no matter how sure they are that they won’t need it, they always do. Usually, this black & white logo also has gray scale. Because of this, as part of my own practice, I’ve begun creating a monochromatic logo as well. This comes in handy for screen printed t-shirts, vinyl banners, etc.